c) Turns on a cassette deck that plays whatever cassette i decide to put in there at the time, identified by the placard on the video stream. The first one is a cassette tape that happened to be in the deck when i bought it at WalMart (even though i bought it “new”) which is interestingly enough some record of a woman doing some piano and voice lessons of some sort. It’s a pretty fantastic tape, and i almost don’t want to switch to anything else. I toyed with the idea of making the background TIX clock also a part of the setup, but opted instead to have that be powered independently so that it can show the correct time and create at least some visual interest while WIMSI is turned off. It’s unfortunate that IFTTT functionality currently makes it so that if someone tries to activate it remotely they have to wait up to 15 minutes before it actually turns on. I also don’t have a good way to turn it off automatically after a preset amount of time (i could turn it off instantly, but it’s so brief that it defeats the purpose), so i’m probably going to do some manual manipulating if i ever get a wemo email, but i’m okay with that for the moment. it’s incredibly crude, but it’s a start. Feel free to toy with it any time. send me an email or a comment with any feedback or issues. 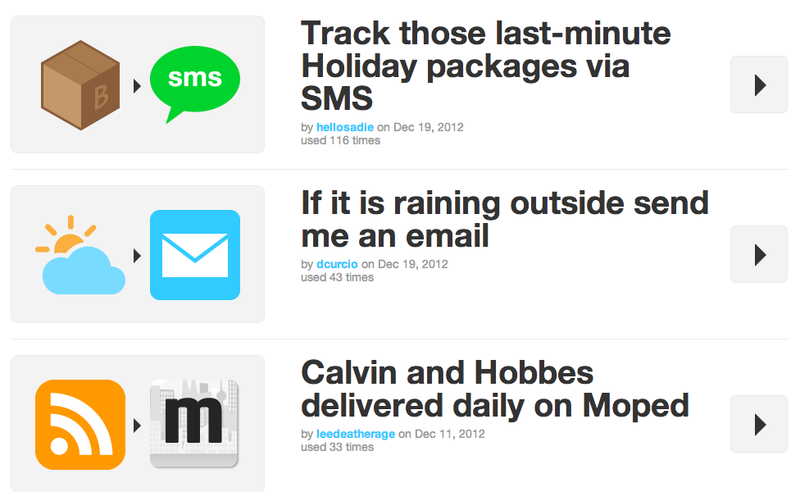 IFTTT is much more limiting than i want it to be for reasons that are perfectly reasonable for anyone else except me. For those that don’t know, IFTTT stands for “If This Then That”. It’s basically a web-based scripting website where you can automate mainly web-based tasks by creating what they call “recipes”. If the weather forecast calls for rain tomorrow, send me an email. If i take a picture with instagram, automatically upload it to my Dropbox account. If I star an email from gmail, create a text version of that in Evernote. etc. etc. All of the recipes involve the manipulation of software services on the web with one notable exception: WeMo products. The WeMo Switch is an electrical outlet that you plug into another electric outlet. A plug into a plug. The difference is, the WeMo has its own WiFi network, and you control the WeMo through an iOS app (I bet there’s an android version too, but i don’t know that for sure). The WeMo Motion is the same thing as that but also has a motion sensor in it as well. The iOS app recognizes all of the WeMo devices that you have set up on the network and puts them into a list where you can individually turn them on or off through the app. You can also set a schedule for them based on absolute time (turn this WeMo switch on during the hours of 18:00-21:00) or with the Motion based on relative time (turn this WeMo Motion off fifteen minutes after it’s detected any motion). As it happens, the WeMo can be integrated with IFTTT – so if, for example, the forecast calls for rain tomorrow, instead of sending an email, i could opt to have it turn on my WeMo switch. 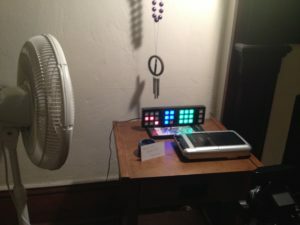 This has spurned this idea for me creating some sort of physical sound and motion installation in my living space that i want to be controlled by the internet. Someone sends any text message to the WeMo and it will activate. Someone sends me an email with WeMo in the title and it will activate. 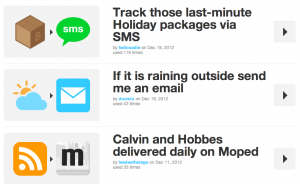 The problem is that IFTTT is mainly geared towards single-user manipulation. For example, the facebook “channel” options i have for “If this” are mainly actions that i control – if i post a status, if i post a link. The only external control is “if someone tags a photo of me on facebook”. Similarly, i can’t tell just anyone to send a text message to x telephone number that will activate my switch – the rule of SMS is that it can only send SMSs to IFTTT’s telephone number from a single incoming telephone number that is has been pre-approved as a link. The way i want to use IFTTT and WeMo is more public than that – i want the internet to control something in my house. Currently i have a rule set up where sending me a gmail with “Wemo” somewhere in the subject will turn on a light in my front room. I’m probably going to tighten that up to have it route to a specific email address instead, wemo@mendellee.com or something so that there’s more potential diversity in the subject line, but that could have a side effect of constant activation if spambots get a hold of that address. The other issue right now is that currently IFTTT only supports activation and deactivation of a single WeMo device on a single network. That’s fine for right now since i only have one WeMo, but in the final installation i want to create, i want to have at least two distinctly controlled WeMos – one by a random outside source such as the weather, and one by people who choose to interact with it. IFTTT does have a statement that they want to add multi-WeMo support at some point, and with the scope of what i’m trying to do with my installation which involves some custom instrument building in which i have no clue how to do, it’s likely that they’ll get support of that before i’m ready to use it in that way. At the very least I know that the basic idea works and from there i can see what i can do with it, and in the meantime people can have fun turning my front room light on or off whenever they please. The next step is to set up a streaming video camera. The camera is the easy part, a constant 24hr stream may be trickier just because i’ve never looked into it before. But i’ll set that up, and then after that I may change the WeMo to some different sort of application other than the light – although the reason i set that up in the first place was for the practical purpose of giving my front room light when i open up the front door since the chandelier that’s connected to the front room light switch is broken. We’ll see where this goes – it has to be a background project more than a foreground project in any case since i have too much other stuff to do.